The only problem with doing this blog is that you feel you need to constantly be trying different places to eat so never return to your favourites. Well this week, screw you dear reader as we’re going back to Merchant’s to see what’s new on their Market Menu. The Market Menu is fixed price with two courses for £14.50 or 3 at £18.50. Maybe not the cheapest offering in town but considering the fantastic quality of the food it’s great value that keeps us coming back for more. Last time we came here Emily made some bad menu choices that she’s not likely to forget in a hurry so she was determined to make up for it this time. For starters, I plumped for the black pudding, poached egg and apple. While Emily chose the panzanela salad with goat’s cheese. I’m a sucker for choosing anything black pudding related, although was a bit wary that egg and apple are not a combo I’ve ever tried before. Head chef Ben Chaplin never seems to get blends of food wrong though so I trusted him to deliver, and deliver he did. 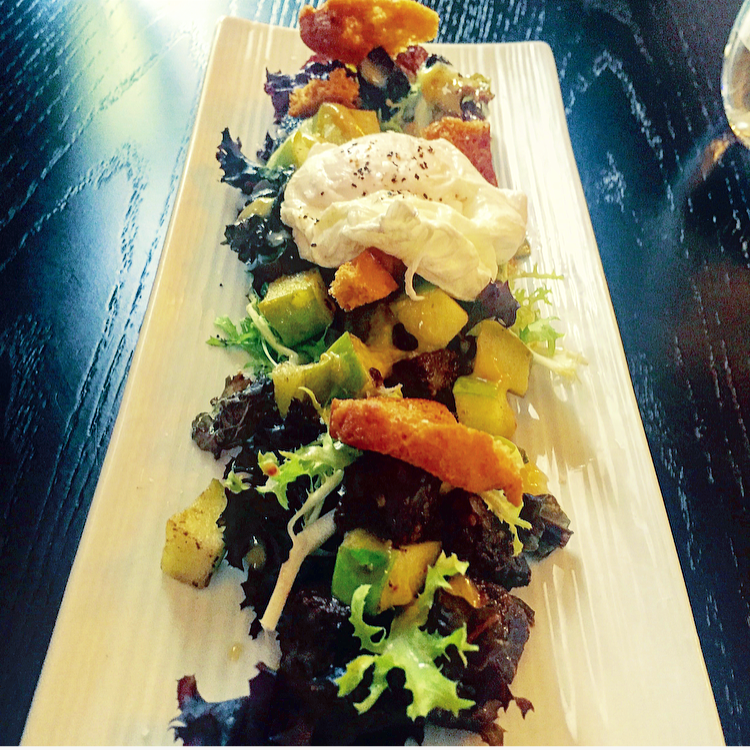 The dish came served on a long plate with chunky lumps of black pudding goodness mixed up with a generous amount of apple – it was topped with a mustardy dressing and poached egg along with crispy croutons. The apple and black pudding went together remarkably well with the sharpness of the apple really complementing the richness of the pud. When dipped into the runny egg yolk, I had to stop myself from running into the kitchen to give the chef a cuddle. My only complaint would be that maybe there were too many apple chunks and not enough chunks of black pudding, but then I am a greedy bugger so I’ll let that pass. Overall, a fine dish that was well presented and offered flavours I’ve never tried before. Emily, although not keen on the mustard dressing (not detailed on the menu) really enjoyed her salad. The goat’s cheese was amazing – so creamy with a delightful nuttiness. 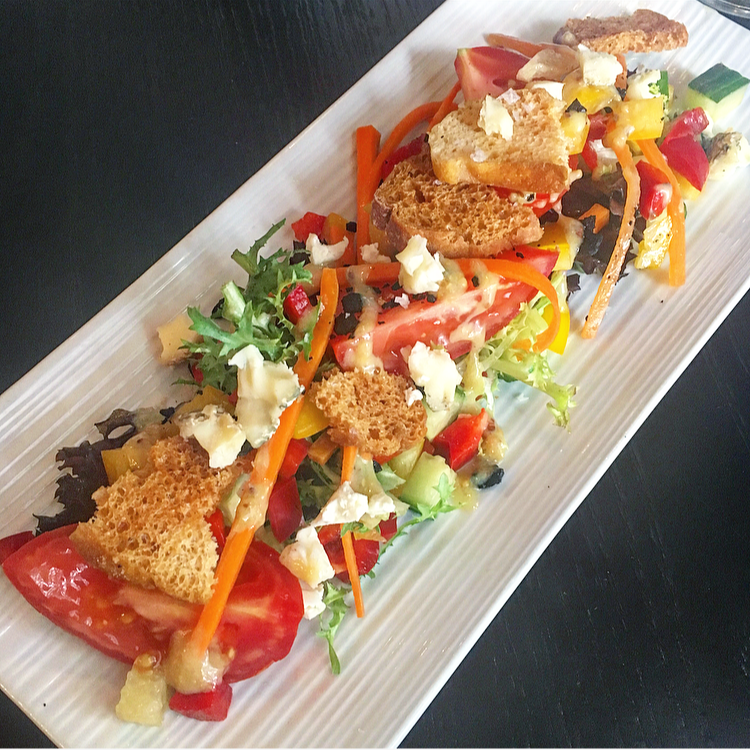 The sharp salad and delicious crunchy croutons were the perfect plate mate. As Emily is always looking for healthy options, this really ticked all her boxes. For the main course we both opted for the sea trout with beetroot and fennel. In our early courting days, Emily once served me a fennel sausage sandwich for breakfast after a night out, the aniseed flavour bringing terrible flashbacks of overindulgences in sambuca the night before. I’d be lying if I said it wasn’t the worst sausage I’d ever eaten and it put us into couples counselling for a month, so I’ve always been wary of fennel since. I usually would avoid any dish where it rears it’s ugly aniseedy face, however I really like sea trout and beetroot so again laid my trust in the hands of the chef and decided to give it a go. 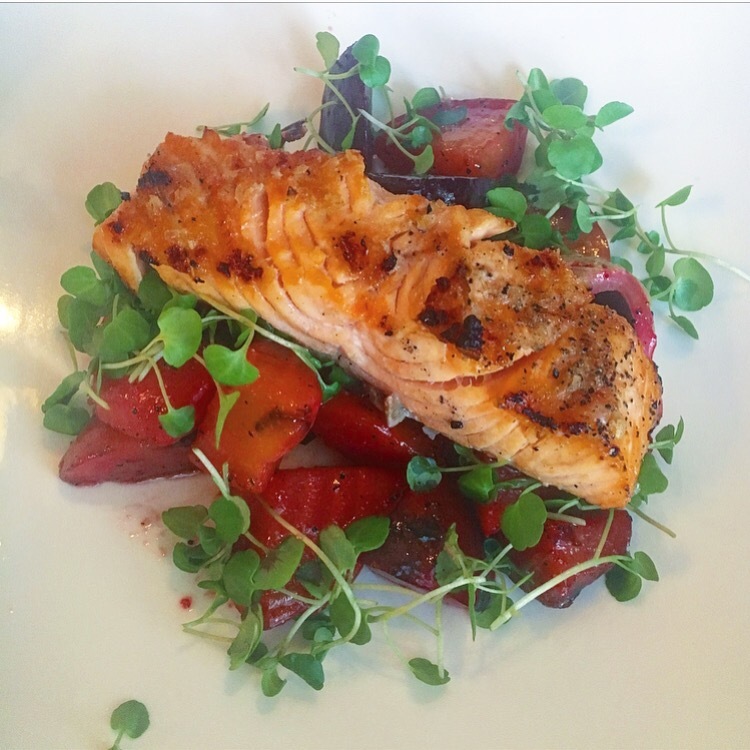 The pink trout arrived with two types of roasted beetroot and a fennel bulb cut into half. The trout was lovely and crisp on top and flaked beautifully. It was also perfectly seasoned and was gorgeous with the sweet, earthy flavour of the beetroot (which is fast becoming our favourite veg). Now to the fennel: despite my misgivings I found it wasn’t offensive at all! It wasn’t overly aniseedy and when eaten with the other elements of the dish worked really well, bringing a lightness and freshness which was actually perfect with fish. My only tiny complaint is that the fennel was difficult to cut into, I’d have preferred it served in chunks rather than halved but the workout probably did me good. This is classic perfection – a few simple complementary ingredients transformed in the kitchen with excellent cooking. For dessert, I opted for the sticky toffee pudding that came with vanilla ice cream. Emily chose the homemade chocolate brownie with raspberry sorbet. I’ve eaten the toffee pud here before so knew I was in for a treat and it didn’t disappoint. 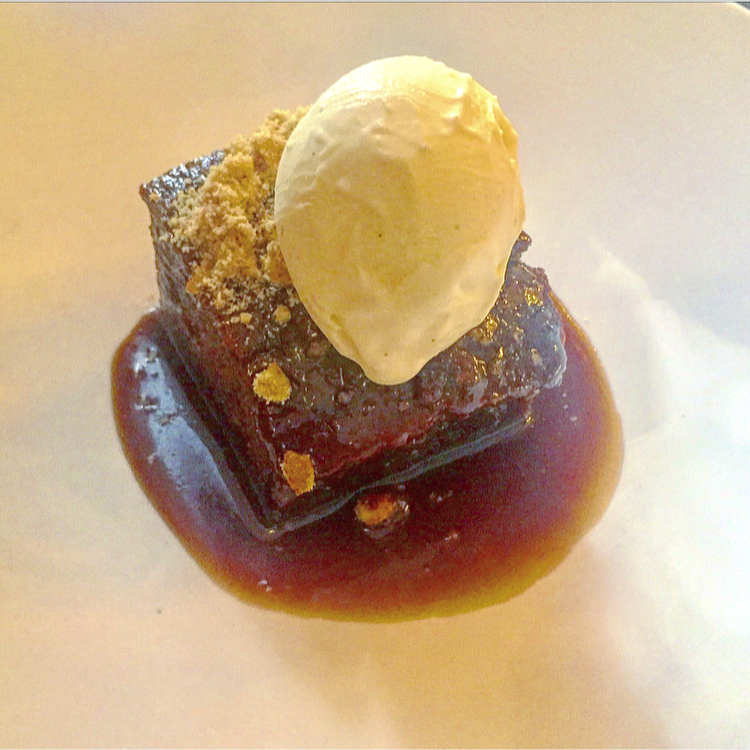 For someone who has never really liked puddings, I’m developing a worrying obsession with sticky toffee puddings. A generous mound of moist toffee cake came topped with gooey caramel sauce, a scoop of homemade ice cream and a crumb which provided some contrasting texture. The pudding itself was just as I’d hoped for: moist, sweet and perfectly cooked. The ice cream was really creamy and soft which I really loved. A perfect dessert and it’s making me drool thinking back on it. Emily’s brownie was a similar success. The menu stated ‘homemade’ and they’re always the best ones. The Merchant’s version didn’t disappoint, this is the best brownies get. Warm, gooey and deliciously rich while still maintaining some dark chocolate bitterness to balance with the sweet. 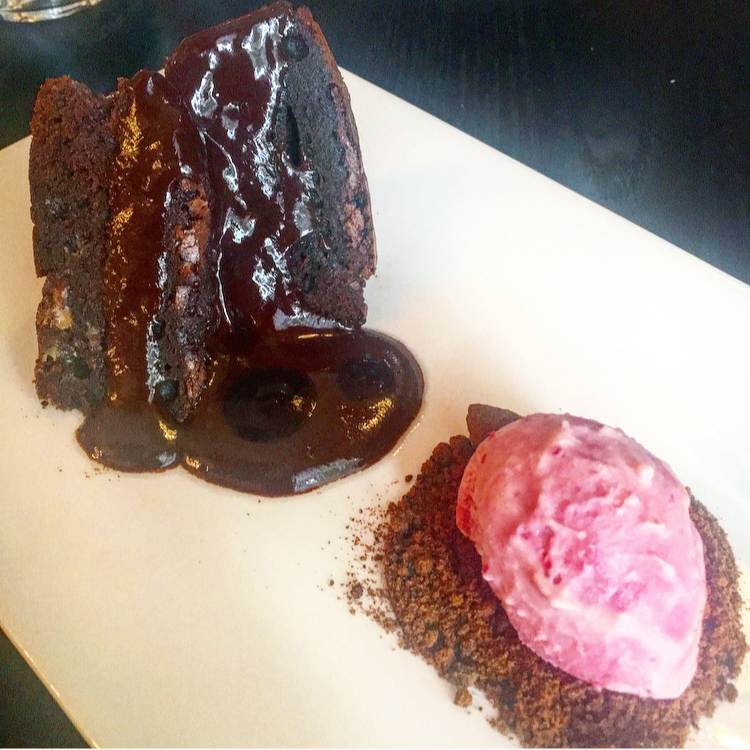 Served with a chocolate sauce, this could be confused with a chocolate fudge cake but the texture of the caked The raspberry parfait was a nice creamy-yet-sharp accompaniment while the biscuity crumb had a gorgeous caramelised flavour that hit he spot. ANOTHER PERFECT DESSERT!! Overall, we both agreed the whole meal was a roaring success and felt guilty for not coming back sooner. I tried flavour combos I’ve never tried before, made friends with fennel and felt thoroughly satisfied with the whole meal. The only thing we don’t understand is why the restaurant is always so empty. It feels like an undiscovered gem that has only just opened, not an established restaurant attached to a top rate hotel. Regardless, we love it there and recommend it to anyone that asks where our fave place to eat is. We’ll just make sure we don’t leave it so long until our next visit.